151. AMRC Collection, Williams Afghan Media Project, Williams College, Williamstown, MA. 88-221. Dupree Collection, Williams Afghan Media Project, Williams College, Williamstown, MA. Bluuurgh. "Taliban in Herat." Digital image. Wikipedia Commons. Accessed September 5, 2010. http://commons.wikimedia.org/wiki/File:Taliban-herat-2001_retouched.jpg. Dupree, Nancy. 0030. Dupree Collection, Williams Afghan Media Project, Williams College, Williamstown, MA. Dupree, Nancy. 1102-27. Dupree Collection, Williams Afghan Media Project, Williams College, Williamstown, MA. Dupree, Nancy. 80-554. Dupree Collection, Williams Afghan Media Project, Williams College, Williamstown, MA. Dupree, Nancy. 84-376. Dupree Collection, Williams Afghan Media Project, Williams College, Williamstown, MA. Dupree, Nancy. 88-73. Dupree Collection, Williams Afghan Media Project, Williams College, Williamstown, MA. Dupree, Nancy. A Sign for a Mosque and Madrassah by Saudis. 1988. Dupree Collection, Williams Afghan Media Project, Williams College, Williamstown, MA. Dupree, Nancy. R7-5. Dupree Collection, Williams Afghan Media Project, Williams College, Williamstown, MA. K-00305-27. AMRC Collection, Williams Afghan Media Project, Williams College, Williamstown, MA. K-00315-19a. AMRC Collection, Williams Afghan Media Project, Williams College, Williamstown, MA. L-00335-21. AMRC Collection, Williams Afghan Media Project, Williams College, Williamstown, MA. L-c-00351-04. AMRC Collection, Williams Afghan Media Project, Williams College, Williamstown, MA. Logari, Durai. "More Nare Kele." Radio-Television Afghanistan Archive. UNAMA, and Eric Kanalstein. "Photo of the Day: 4 January 2010." Digital image. UNAMA's Flickr Photostream. Accessed September 5, 2010. http://www.flickr.com/photos/unama/4243349911/. UNAMA, and Fardin Waezi. "Attack in Kabul: 18 January 2010." Digital image. UNAMA's Flickr Photostream. Accessed September 5, 2010. http://www.flickr.com/photos/unama/4284846506/in/photostream/. The Taliban have become infamous across the world for their authoritarian rule over Afghanistan in the 1990’s, for harboring Osama bin Laden and al Qaeda, and for their ongoing insurgency against the American-led coalition. But when they originally took power in Afghanistan, they were seen as a force for good. When the Marxists took power in 1978, a large percentage of the population, 3 ½ million people over the next five years, fled into Pakistan; and an estimated million people fled to Iran. At the time, that was probably close to 20, 25% of the Afghan population became refugees. There were reportedly originally more than 100 Afghan political parties in existence in Peshawar, Pakistan across the political spectrum—nationalistic, regional, tribal, socialist, conservative. But the Pakistan government decided that they were only going to recognize seven official political parties. All seven of those parties were Islamic. So it was really the decision of the Pakistan government that indicated or that determined that it was only going to be Islamic parties that became legitimate representatives of the Afghan people. During this period of time, the Saudis and other outside groups had funded religious schools. And so there were a large number of religious madrasas that had sprung up to deal with the younger generation of refugee males. I think that’s significant because a lot of those people, while they were Afghan they spoke Afghan languages, they were nominally Afghan in terms of their culture, many of them had never actually been in Afghanistan. They had never been, many of these young men had never grown up in villages, they’d never been around their aunts and their sisters and the normal range of females of different ages and different relationships to themselves that somebody growing up in a village would have. A lot of them had been in boarding schools and religious schools only among other boys for most of their lives. 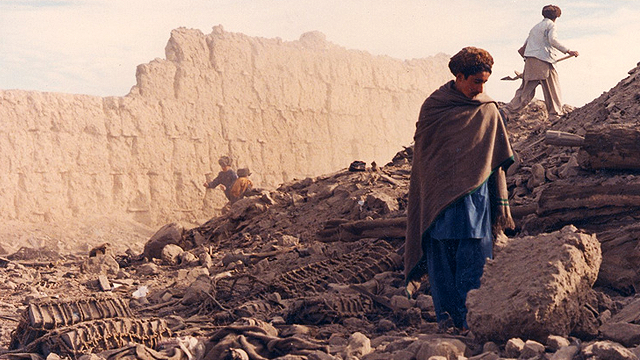 After the Soviets withdrew in 1989, Afghanistan entered into a period of chaos. What followed from 1989 until 1992 was a period in which the Islamic political parties that had first taken root in Peshawar in Pakistan started fighting amongst themselves. And all through that period up until 1995 they were fighting amongst themselves, and because they were no longer receiving funding from abroad, and at least not in the same amounts as they had been, they also started preying on the Afghan people. Started looking for revenues by taking the resources from the people themselves. The Taliban initially came to end this chaos and to eliminate these warlords and commanders who were taking advantage of the Afghan people. It was only later when the Taliban came to power that they became more rigid, more autocratic, more authoritarian in the rule, and particularly in Kabul, which was a more liberal city, a more modern city, through this whole period of the Soviet occupation, particularly women had been educated and had roles in ministries and other occupations. They really clamped down on the role of women in social life. And it was then that the Taliban got their reputation as being backward and particularly despicable in relation to their treatment of women. But initially it’s important to recall that they were considered by Afghans a force of good, of reclaiming morality in the country. The Taliban became notorious for their authoritarian rule, harboring terrorists, and insurgency against the American-led coalition. But in the beginning, they were considered a force for good.